Boutique Hotel with Great Value, Modern Amenities, & Lush Gardens. 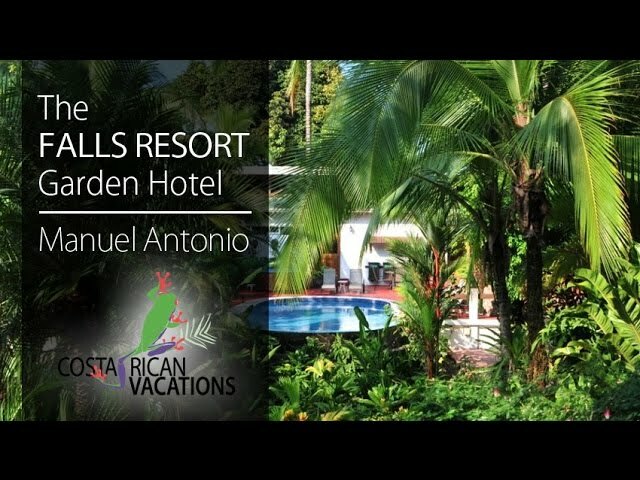 Tucked into tropical gardens in the Central Pacific region of Manuel Antonio, The Falls Resort is a perfect example of Costa Rican hospitality. Understated and comfortable, with modern amenities and resplendent gardens, it’s perfect for families and couples looking for a little oasis just a few minutes from the area’s famous beaches and national park. The Falls Resort is comprised of 23 guest rooms and one apartment. All rooms come standard with A/C, cable TV, DVD player, a stocked minibar, coffeemaker, terrace with seating, and walk-in closet. The swimming pool is surrounded by gorgeous and lively gardens where one can spot hummingbirds, squirrel monkeys, white faced capuchin monkeys, basilisk lizards, sloths, parrots, toucans, and more! They offer complimentary WiFi in the bar, restaurant, and lobby. The Falls staff can also arrange massage treatments for guests. The hotel’s on-site restaurant, The Falls Garden Café, serves a variety of local and international dishes with reasonable prices. They are open for breakfast, lunch, and dinner daily (but close early on Sundays). The chefs can accommodate special diets as long as guests are clear about restrictions. Buffet breakfast is included in the nightly rate. The lush gardens provide a home and shelter for seven types of hummingbirds, squirrel monkeys, white faced capuchin monkeys, basilisk lizards, sloths, parrots, toucans, and much more. More than a thousand plant varieties are on the property, including dozens of orchids, herbs, and fruit trees. Snorkeling, kayaking, hiking, rafting, and more are available activities in and around Manuel Antonio.